This redheaded woodpecker was pounding and scooping out a hole for nesting. He worked on this project for hours while I watched and photographed the event (229 photos total). I used a Canon 50D with a EF400L f/5.6 Lens. I am the Permissions Coordinator for the Cornell Lab of Ornithology’s Handbook of Bird Biology. 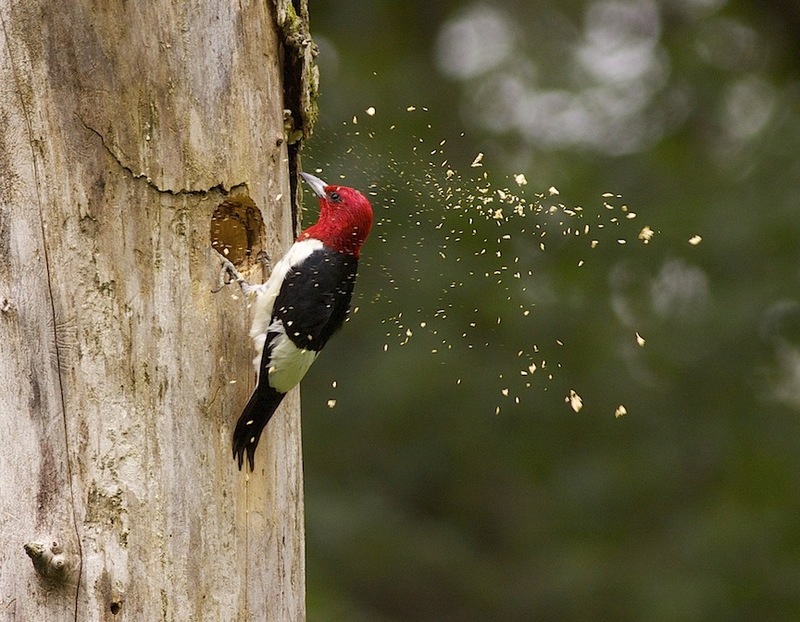 I am writing because we are publishing the 3rd edition of the Handbook, and I would love to submit this photo of the Redheaded Woodpecker with the wood chips flying to our editors for inclusion in the Handbook. Would you consider helping us by contributing your image for use in the Handbook and its web site? To give you more information on this project, the Cornell Lab of Ornithology (www.birds.cornell.edu) at Cornell University is a world leader in research, education and outreach, and conservation of birds. Our 3rd edition of the Handbook covers all major topics relating to the biology of birds, including their behavior, conservation, anatomy, physiology, ecology, and evolution. It will be an essential reference on birds and all aspects of their ecology, presented in a style accessible to nonscientist birdwatchers, college students, and teachers. In this edition, we also hope to speak to an international audience by using examples of bird species and data from around the world. The Handbook is being co-edited by Cornell Professors John Fitzpatrick, Walter Koenig, Irby Lovette, and David Winkler, and includes contributions authored by more than a dozen professional avian biologists. If you are willing to consider this request, please send me your email address so that I may send you a License Agreement to review. My email is .